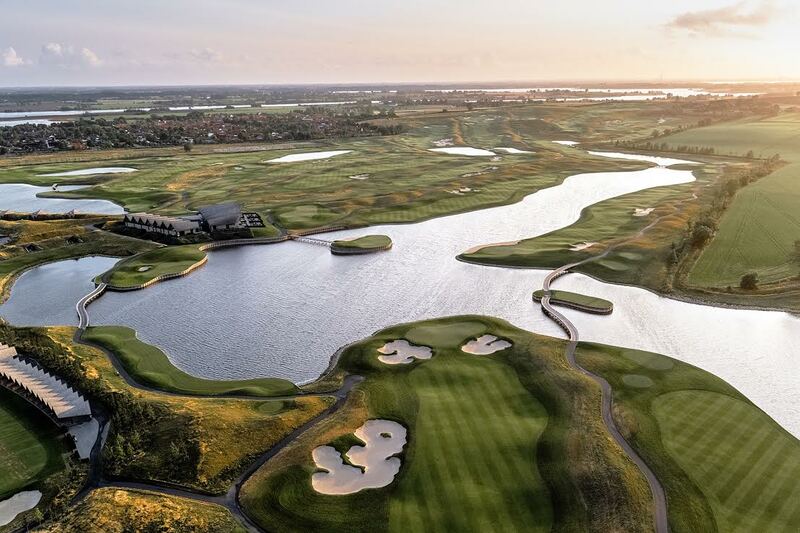 Great Northern (Denmark) — Congratulations to all of our friends at Great Northern on being recognized as one of the best courses in Denmark! The Nicklaus Design team has had an incredibly rewarding experience at Great Northern, where the project management team has demonstrated an unwavering commitment to excellence throughout the development process. From the course’s early vision to ultimate reality, its world-class benchmarks have been achieved by a great team with special thanks to the dedication by Nicklaus Designer, Dirk Bouts. One of our priorities is to incorporate the natural land features into the design process. Bouts’ astute awareness reflects two beautifully positioned nine-hole layouts, with several shots bringing adjacent hillsides along the property into play. The Nicklaus Design team embraced the existing bodies of water to influence the strategy of play and provide beautiful views as part of the golf experience. During the design process, the leadership at Great Northern became fond of wood bulkheading, which was incorporated into a variety of holes. The results speak for themselves in terms of visual shot values, presentation, and course character, as these waterside bulkheads have become a distinct feature of the golf course. The ultimate advantage of the Nicklaus Design process is activated when our team can work intensely and thoughtfully on the ground with our client’s. Just like 28-year Nicklaus Design veteran Bouts, we have a designer in every region of the world ready to be engaged and active on the ground in each market. Widus Golf Resort (Philippines) — Nicklaus Designer Jim Wagner recently toured the firm’s newest golf course project outside New Clark City, Philippines. Widus Golf Resort is a unique property that has a distinct set of characteristics and offers breathtaking views of Mount Arayat to the East, and Mount Pinatubo to the South. Wagner learned some dynamic background information on these regional landmarks including the fact that Mt. Pinatubo is an active volcano that last erupted in 1991. Jim lives in nearby Manila and is excited to be on site regularly to see this wonderful property grow into a world-renowned course the client can be proud of for decades to come. As a variety of courses continue through an active construction season, we want to update you on some of the exciting activity underway for new Nicklaus golf courses. Executive Vice President Paul Stringer traveled throughout Asia last month and spent time with existing clients in addition to exploring new opportunities with developers from Korea, Vietnam, the Philippines, Thailand, and China. A longtime member of the Nicklaus licensing family and a true leader in innovation describes the newest product line and what it means to work with the Nicklaus Companies. One of the founding partners of Ahead, Lord points out that Nicklaus was the company’s first ever license, now in its 20th year: “Loyalty, longevity, and success are the cornerstones of our relationship. And we have a lot of fun along the way working with the Nicklaus Team.” Click the link below for more details on our partnership and the Jack Nicklaus Majors Collection. Delaware North and Nicklaus Companies partnered to bring together one of the world’s top brands with the leader in food service. Featuring Nicklaus family’s famous home recipes, the first two Golden Bear Grills continue to grow in sales in offering a superior customer experience. The restaurant debuted at Fort Lauderdale-Hollywood International airport in the summer of 2016 and the second restaurant launched in the Charleston International Airport three months later. The walls of each Golden Bear Grill are adorned with striking Nicklaus memorabilia and the new Nicklaus lifestyle products including the Jack Nicklaus Majors Collection hats, Jack Nicklaus Apparel, Jack Nicklaus Accessories, Nicklaus Wines and more! Most customers consider the restaurant a miniature museum of sorts, featuring game-used equipment and accessories from Jack’s unparalleled career on the course and in the business world. For all those traveling through the Fort Lauderdale and Charleston Airports please do yourself a favor and check-in early for your flight so you have time for an unforgettable culinary experience at the Jack Nicklaus Golden Bear Grill. Looking forward, the Nicklaus Companies is excited about the opportunity to do more work with the fantastic people at Delaware North. Nicklaus apparel partner for Italy, Golf House S.p.A Group, hosted 28 Nicklaus tournaments across Italy for the brand’s loyal followers and to advance a winning team to the first tee of the JNII Italy National Final last week. Sancarlo and Turla, a young couple from Milan, scored an unmatched 59 (13 under-par) to win the event outright. The stellar team efforts wins them a trip of a lifetime to Columbus, Ohio, where they will join national champions from around the world to play for their country in the 2019 JNII Tournament of Champions. The VIP experience includes watching the world’s best players up close at the Memorial Tournament presented by Nationwide. The Jack Nicklaus International Invitational gives recreational golfers a chance to play tournament golf on world-class courses. Open to all who love the game, men and women of all skill levels are invited to enter this enjoyable, social event that promotes camaraderie as much as it lights the competitive fire. 2019 is the 13th year of this international team event that has been held in 12 countries around the world. To learn more, visit www.jniigolf.com.